Peter Watkins is the film director whose work you likely haven’t seen, but definitely should. He is best known for his work in the 1960s and 1970s, including Culloden, The War Game, and Punishment Park. The common method for these films was to take a “you are there”, documentary approach and treat the camera as if it were an actual witness to the events as they unfolded. So while it may be a bit jarring to see and hear a TV film crew interviewing and reacting to Scottish rebels in 1745, you see his point in doing so pretty easily. Another trademark of Watkins’ work is to use people who are entirely untrained in acting, or are at most amateur theatre performers. He began this practice with his early amateur films but kept on with it throughout his career. It’s one of these early amateur films I want to draw your attention to today. 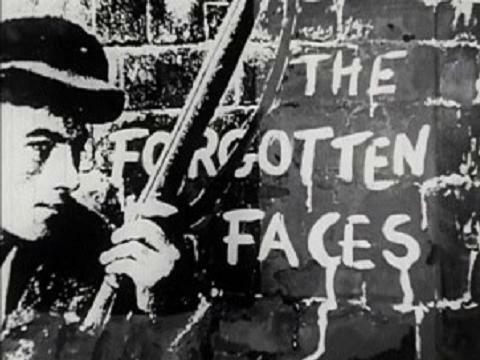 It’s The Forgotten Faces, an 18 minute film made in 1960 with amateur performers in a back street in Canterbury. It’s an impressionistic view of the Hungarian Revolution in October 1956. In all the work and thought I’d invested in Nights of Fire, this film was always in the back of my mind but I never mentioned it until now. Nights of Fire is still on track for a March release. Thanks for bringing the film to my attention Brian. I’d watched Punishment Park and The War Game before but was unaware of this one. He made another one about the same time, Diary of an Unknown Soldier which is about the last day in the life of a British soldier in WW I. I don’t know if it is also on Youtube but it is an extra (along with Forgotten Faces) on my DVD release of Culloden and the War Game. The BFI shop offers a double DVD of Culloden and The War Game for not much, and a DVD of Privilege (another very interesting film) with the two short amateur films for a bit more. I’ll pick those DVD sets up. I’ve watched The War Game a few times (studied it for my BA) but have yet to see Culloden. Thanks Brian, that BFI thread led to some other fascinating films. ‘It Happened Here’ (1965) makes great viewing for the Codeword Cromwell game, an urban companion to BFI’s ‘Went the Day Well’ (1942). Thanks, the BFI is a great institution. It Happened Here has a really interesting making-of back-story, too. …a brilliant bit of filmography Brian. Engrossing to see these ‘young revolutionaries’ revolt against Communist oppression and brutal central government – an idea dangerously flirted with by today’s ‘young revolutionaries’ who know not the face of such dictatorships and fantasise about communism as a way forward.